So as I come back from a bit of a self-imposed blogging hiatus, I have been pouring over feeds and catching up with my blog reading. There have been a lot of interesting things that I've missed and likely would have posted but it's too late now (and no, this is not an apology post). One trend that I have been meaning to write about for some time made itself known, however. 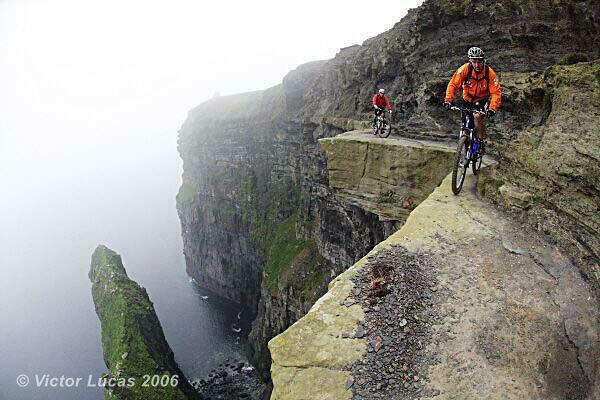 I noticed that there are a few cycling related photos that seem to crop up all the time. Sometimes a blogger posts the photo because they think its new and they found something cool first. This is not an indictment against these bloggers as it is an easy and innocent mistake to make. But more and more I see bloggers referring to these photos to illustrate their point or to reference something previously written. Therefore the more they are referenced the more they become embedded in our minds and emerge as classics within the cycling culture. 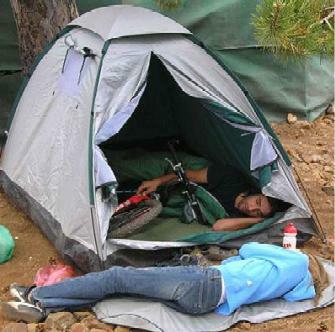 Man Sleeps With Mountain Bike in Tent, Kicks Girlfriend Out - This has got to be one of my all time favorites. "Oh baby, I'm sorry. You understand, right?" 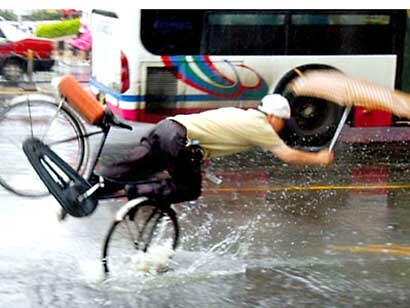 Pothole in Puddle Leads to Face Plant - This one is made even better because the rider is holding an umbrella. The scene is set in China where it first surfaced about a year ago. Apparently the photographer was aware of the pothole and instead of warning unsuspecting cyclists he layed in wait to get the perfect shot. His excuse was that he needed to prove that the government needed to do something about the dangerous pothole, which had been untouched for some time. Peekaboo Bike Shorts - Oh the ladies can't resist this one. Though stubby over there ought to be ashamed. Living on the Edge - Here Hans Rey and Steve Peat traverse the famous Cliffs of Moher in Ireland. Part of a pub crawl in which they rode to 30 pubs in 6 days. The photos are from adventure photographer Victor Lucas. Check out this short video of the pub crawl. There's a quick behind the scenes look at this shot.